daniel the smith a is what leaps out at me. JoazBanbeck It leapt out at me too. Fortunately, I had the presence of mind to duck. :) If 'a' is really needed, let us play 'b' first. He connects, then we play 'a'. daniel the smith Hmm... if black c, white will d (white a looks awful for white)-- looks better for white to me. So what about black d directly? Then I guess white c and that doesn't look good for black at all. I'm still thinking a is best. Kirby Yeah, maybe 'c' is too aggressive. When I do try to read it out, it doesn't look great for us. topazg 0.7 for 'd', 0.3 for 'a'. Kirby What's the sequence you have in mind if white plays 'c' in response to 'd', topazg? topazg I'd then connect at 'a'. If we are going to do it anyway, I'd rather White doesn't get 'd'. It's not like the ladder works for White, so he has to allow us to capture his last stone. Either that, or he allows us to squeeze, which looks really bad for White. daniel the smith Added a couple more diagrams. I'm 1.0 for a still. Kirby I am starting to think that our last move was a mistake, too. I don't know how to fix it easily. I will vote 0.5 for 'a', 0.1 for 'b', 0.1 for 'c', 0.1 for 'd', and 0.1 for 'e'. Kirby I'm still not sure about the best way to play, but one thing to consider is that, if we play 'a', Magicwand will probably fix. We could try to take the opportunity to cut our local losses and proceed to attacking the two top white stones, like we wanted to awhile back. The bad part of this is that it probably ensures that our previous move was a bad one (unless we can work something up later). daniel the smith I still think a, he fixes, we cut at i is best. Kirby I'll switch to 1.0 for 'a'. I'm not sure about the followup, yet, because it'll depend on what he does. topazg Let's go with 'a' then, it definitely looks like the most reasonable move, although I'm 90% sure that makes our last move a mistake. We're going to end up with a single weak Black group floating around White's groups (one of which will be completely settled with points, so it's not even 1 weak group against 2), and we'll have lost an unpleasant amount of our corner investment. I really don't like the cut at 'i' now, as White can sacrifice those two stones quite easily. It's like 5-8 points or something, probably in gote, for us to cut there now. JoazBanbeck I realize that Daniel is probably right: 'b' is aji-keshi. I could settle for 'a'. topazgI've added the continuation I was expecting. I half want to play at :w4: right now, but I think we've got to look after the corner, or what we were doing for the last 5 or 6 moves? daniel the smith I'm pretty sure I greatly prefer this; white is not nearly as thick, we have sente (white has to do something to control that cutting stone), and the cutting stone will still have large amounts of aji. daniel the smith Here we still have sente, but white is much thicker and I'm not sure that is worth that. If we aren't careful it might even become a target. topazg As long as we extend at 'n' instead of the atari, I'm happy with this - 'h' last move feels like a mistake now though, unless we can start some pretty serious attacks going. White can settle in a move on the left, so we must split asap. Dusk Eagle I had thought of this move already, and I personally don't want white coming into our corner without a lot of compensation. As such, a is a natural move. But is it actually good? 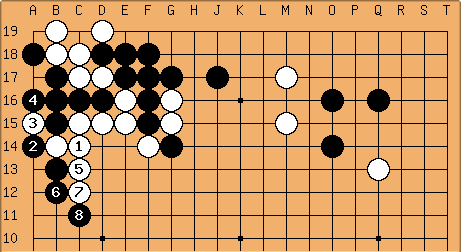 Well, if white goes off to defend the right cutting point, we can play 'b' and we'll be able to connect out (See diagrams 22a and 22b). 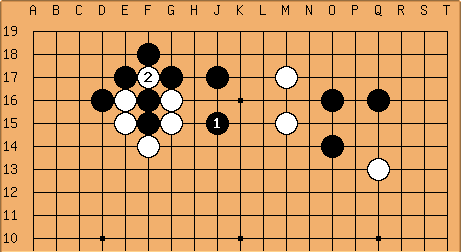 Or, if white defends against the left cut, we can then cut at the other and white is torn into two, which looks very bad for him (see diagram 22c). So a looks like a good move to me. JoazBanbeck Without analyzing DE's suggestions - or my own - I'm going to suggest a move that I would play in a blitz game. We're strong, he's weak, ergo we must attack before he recovers. I suggest 'c'. It's thematic. Having thought for a few minutes, I like the whole-board play of 'd' better than any of the other three. topazg I'm also thinking about 'e' followed by 'f'. If he responds with 'g', both 'h' and 'i' cuts are huge. I'm not overly keen on 'c' because he gets at least as much as we do by pushing towards the edge. Will have a think about it. Dusk Eagle I'm not a fan of peeping at a cutting point - it feels way too aji-keshi IMO. I think the direct cut at i is better than e.
JoazBanbeck When I look at 'e', I think of it as a probe designed to make white heavy. Unlike most peeps, it aims in two directions, not one. It aims at the obvious play to the west, but it also aims at connecting with J17 to the north. Consequently, it is not aji-keshi unless he responds to it twice. IMHO, the proper direction of play is to split white. So my preliminary vote is 50% 'd', and 50% 'e'. I await further diagrams. Kirby We could consider cutting immediately at 'i'. Does the sequence below work for us? I don't know if it does - I haven't read it out completely (but it's an idea). topazg This is such a complicated position to play. I'm beginning to lose faith that a cut at 'i' has enough impact on anything. It doesn't have enough pressure on the two stones to the right, and White can let the two stones above rot. He can play in the corner (and I'd atari on the other side, Kirby, I don't think why White wants a complicated liberty race when the atari on the other side is free secure points). The more I assess it, the more 'a' or 'c' seem to have the most direct value. 'c' I think lets White fix everything for a huge wall of thickness, and I don't think that's aji we should leave. For the reasons DE game with respect to the variation with a cut at 'i', I don't think White can connect easily even if we don't play 'd'. I really want something like 'j', aiming at either 'd' or one of the 'k' points. However, the corner feels more urgent. I think 'a' probably trumps it, as we can ignore a further White descent, and I think White playing 'a' is painfully huge. Afterwards we get to cut at 'h' if he plays somewhere else. So, 0.6 for 'a', 0.2 for 'd', and 0.2 for 'e'. FWIW, I think with the voting system we can make it a bit more valuable by eliminating options one at a time. Both Joaz and myself have split 'd' and 'e' points because we think they are both interesting ways of working towards the same objective. However, it means as individual nominations they are each weaker than they could be. Really, my vote is 0.6 protect the corner, 0.4 split White. As a result, if either 'd' or 'e' look like they can't win, I would like the other to have the full 0.4. JoazBanbeck A man ought to stand for something. This wishy-washy vote-splitting was making me dislike myself. :) I change my vote to 100% for 'e'. ...a few minutes later: the more I look at this the more a seems like the only move. White can't fix everything in one move. I may change my mind vote to a, but first I want to see what people think of h.
JoazBanbeck The one thing that I can say for 'h' is that it is consistent with our last move. The advocates of our last move claimed as its primary virtue that it created cutting points, and 'h' takes one of them. Move 'a' feels too submissive to me too. topazg I agree 'h' is consistent, and would support it, although my reading after White takes 'a' is that it isn't so good. The reason I am opting for 'e' is I don't believe that cutting point will ever be truly useful now. What can we do with it - capture two stones? Even at this stage it seems to have been demoted to big endgame already. 'h' is a much more valuable cut IMO. However, whilst I feel the same that 'a' is submissive, I feel that it implies more as an earlier mistake that perhaps Joaz was right with move 18, and I should have trusted my first instinct to split then (although I wanted to instead of 'a' earlier :D :D). Now, White taking the corner away from us with 'a' seems to make a mockery of our last few moves. I can't see anything we have severe enough to stop White from taking 'a', other than taking it ourselves. daniel the smith I added diagram 22J.1 to discuss black h, white a.
Dusk Eagle Having read the discussion, I still think a is the best move (like Daniel mentioned, white cannot fix everything at once. Also, by keeping white out of the corner, it makes it a lot harder for him to settle his shape). However, h looks pretty good too, and c might be okay, though I fear white can get too many forcing moves along the outside which will make him stronger. So right now, I'm sticking with a, and I don't really feel like splitting my vote up. But h would be my second choice, for what it's worth. daniel the smith Perhaps we should vote between side (d/e/f/i) and corner (a/c/h), and then narrow down the specific move. I feel rather strongly that something in the corner is correct: a is along the lines of "make a fist before striking", and h (tries to) fix a weakness by going on the offense. 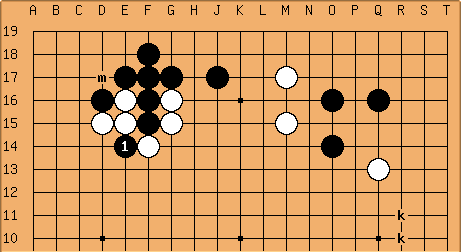 The moves in the middle all seem to leave a large problem in the corner without doing equivalent damage to white (the two stones feel light). topazg Sounds good. I'm 0.6 corner, 0.4 side. If corner, I'm 0.7 'a', 0.3 'h'. If side, I'm 0.5 'd', 0.5 'e'. Dusk Eagle I'm 1.0 for the corner. I like a the most, but I think h is also pretty good, and my third choice of all the moves proposed would be c.
daniel the smith OK, that's already a slim (2.6) majority for the corner, so unless Joaz (or Kirby) has a new argument for the side, it looks like we'll be playing a, h or maybe c. I'll say .8 for h, .2 for a.
JoazBanbeck If you guys really want to play the left side/corner rather than the middle, I vote for 'h'. But my favorite is still to push into the middle with 'd' or 'e'. I still think that letting white have 'd' ( J15 ) is huge for him. We obviously do not have a good understanding of this position, and it may be premature to vote. I've got an idea: Let's play out the game multiple times from this position on KGS - sort of Monte Carlo method with people instead of computers. I can be arrange to be on KGS from 9:30AM to 11:00AM and again from 1:00PM to 4:00PM Pacific time tomorrow. I'll take either the white side with 'a', or the black side with 'd' or 'e', and maybe other variations. PM me to set up exact time if interested. topazg I disagree. I think we have reached a point where voting is worth it. We've all considered the position a fair degree, and viewed a number of variations. I'm happy changing my vote to 1.0 for the corner if it breaks some form of stalemate and keeps the game moving. This game is interesting to me, but I certainly don't have the time to start doing prolonged analysis on KGS for it. Kirby I liked 'i', but if we don't play 'i', I like 'h' second best. So I will vote 1.0 for 'h'. daniel the smith Joaz, if I had any time I'd take you up on that, but I don't, so... :) OK, it looks like h is winning so now would be a really good time to bring up any counter arguments against it. I will try and come up with one on my way to work. I'd suggest that we keep the voting open until this evening, since it is a difficult position. Dusk Eagle We've thought about this position long enough. To keep the game moving, I'll throw my vote to h.
a: .7 (topazg) + .2 (dts) = 0.9? JoazBanbeck This looks good for white. In typical MW style, white is connecting up his weak groups, controlling the center, and building a gauntlet for our upper right group. Dusk Eagle I think white's connection is actually very weak, and we can cut it like this. If white doesn't respond with , we can always attack his group with a (which duals as an extension from our hoshi stone). I think this looks quite nice for us. Dusk Eagle This is perhaps a safer way to play. 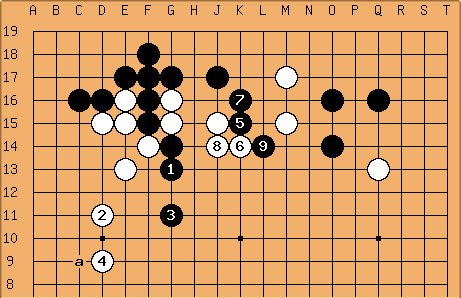 I'm not exact on the placement of , but it seems easy to cancel out white's center influence, and white needs to spend a move to fix his connection. Now that I've posted it, I like this variation more. JoazBanbeck I don't prefer this variation, but if we did play it, I'd want to see 5 at 'x'. Kirby Can we get away with this? JoazBanbeck Maybe. See next diagram. daniel the smith Makes it difficult for white to cut at m, even after a white response. I think. Likely continuation? daniel the smith If this happens, 1 is still full of aji and i is suddenly a valuable cutting point. Does white have a better 4? daniel the smith: is it even worth discussing? I vote a, leave white with cutting point(s). topazg Agreed, and we get a nice big corner by the looks of things. Depending on where he fixes, I want "b" next - that way we either swallow the stone or get chased across to swallow the pair? Dusk Eagle: I think a is a must. White will have two cutting points and that makes his shape very ugly. If he captures out two stones (in sente, as he then threatens the corner), his group gets so much stronger. JoazBanbeck I'm dead tired after a 12-hour work day. ( Yes, it was very profitable, thank you ) But my first reaction is 'c'. A hot shower and two asprins later, I still hold the same opinion. I disagree with DE's assement of MW's play being sente. If we tenuki to J15, we get an extra move in. Sure, we have to recapture locally, but MW realy does not have sente because now he has to reply to J15. He is effectively in gote, not sente. I agree with Daniel that is is barely worth discussing :) but nonethless I added a few diagrams below. daniel the smith I will think about that, I don't know if I'll change my mind or not. Kirby I vote 9/10 for 'a', and 1/10 for 'c'. Kirby I still feel that the local profit from white's cutting points is worth more than a global strategy that we cannot easily predict. It's true that splitting white is good for us, but we get solid, definite profit by connecting our stones. Magicwand cannot connect to his two stones on the top right in a single move, and we still have the approach at 'b'. I was back and forth between capturing and moving out with the last move, but since we decided to capture, we shouldn't let up in this local area, IMO. daniel the smith Looks like people have pretty much made up their minds and a will win, unless topazg wants to change his vote. Joaz Banbeck...and when we recapture he has no eye space and we are threatening moves like 'd' and 'e'. daniel the smith: White fixed two cutting points in sente, is worth that? Joaz Banbeck Yes, IMHO. Remember, sente is simply the option to take any point on the board. We will have just gotten J15, which IS the most important point on the board. How can sente be better than that? And the two cutting points are mutually exclusive as DE notes below: when MW replies to one he thereby almost fixes the other. We really have only one usable cutting point, and would do better to count them as one. When we get J15, his stones at L15 and L17 are in trouble, which is worth more than either cut. Joaz Banbeck @Daniel: I'm not sure that I follow the logic here. You seem to be arguing that the general truth af a proposition weakens its particular application. Anyway, by whatever process, can we agree that we really only have one usable cutting point? JoazBanbeck "We all know..."? I didn't. Maybe that idea is common knowledge for you folks, but I had never heard of it before. I had to deduce it myself from DE's comments. BTW, this seems to argue for the idea that several 1Ds CAN add their knowledge together. daniel the smith Ah, apologies for my presumption then. :) And I think we're already doing better than a single one of us would have done. JoazBanbeck Uhhh...thanks...but no apology is needed. I am in your debt for pointing out a proverb that most 1Ds apparently knew but I didn't. Joaz BanbeckOTOH, letting white have J15 renders the G13 cut surprisingly ineffective. Dusk Eagle seems like a mistake. If we're going to cut at , we should probably just do it directly. On the other hand, if we consider 's side to be more important, than looks like a mistake. daniel the smith Agree with DE. Joaz Banbeck OK, maybe we can play in a better manner than dia 20C. What continuation would you say is best for us? And is it better than our result in dia 20B? Dusk Eagle Even something like this seems really good for us IMO. White's shape still has holes, and we have a huge corner. I don't think white has made any headway into our two-stone lead, and actually I would say white has lost a little up to this point. JoazBanbeck I agree that this result is good for us. But is it better than dia 20B? In 20E MW has secured his two stones at L15 and L17, and consequently we still have a potential problem in the upper right. In 20B we still get a decent corner, and we have no weaknesses, and he has two weak groups. Why should we play an asymetric game, taking profit early but leaving chances for him to come back? I say we should stay safe all over, and leave him with all the weakness, and no reasonable chance of attacking us. It is the sure way to win. Kirby I feel like 20B and 20E are both good diagrams for us, but 20E makes me feel very confident about the game. Magicwand doesn't have anything, really, and a good portion of the board is finished. If we are ahead now, "finishing" more parts of the board seems like a good way to keep our lead. I think that 20B still looks very good for us, but there is more uncertainty as to what he can do on the left. With 20E, I feel like the game is simplified, leaving Magicwand with a sure disadvantage. topazg I agree, 20B to me feels like a complicated fight still to go on, with no guarantee of success other than a general upper hand. We've effectively given White a giant ponnuki in sente - that _can't_ be good with respect to whole board influence. We're really banking on capturing those 2 stones to play this way I think. 20E just looks like some really solid profit - that's one enormous corner, and White has little compensation other than having a less endangered group. daniel the smith Ah, you beat me to it. I also think a is mandatory. I'm having a hard time figuring out how this could possibly turn out good for white. Kirby I will vote 6/10 'c', and 4/10 'a'. 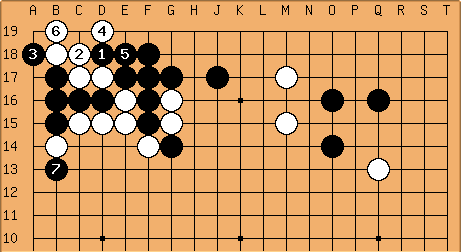 That's because I want to attack the two white stones on top, and 'c' feels better for this objective. If Magicwand plays 'c', his stones are a bit safer on top (admittedly, he does have cutting problems). Kirby I think you've convinced me. White has too many forcing moves if we play 'c'. I will change my vote to 1 for 'a'. Dusk Eagle I would've played c if this was just my game, but I see the merits of a. So I'll go with a too. daniel the smith most likely sequence from each move? Both diagrams end with white to play and me not having any idea where MW would go. daniel the smith The two white stones do feel more threatened here. daniel the smith White has one more cutting point here and two fewer forcing moves. topazg Assuming we accept his Black 14, I propose 16 at "a". We have to create some form of messiness here, even though he can cut again at "b", I don't consider his line too worrying - we get compensation and can attack both the two stones on top and the stone on the right side. What's more, the top left has huge amounts of aji left. It feels very hard to play for White to me here. Kirby I vote for 'a'. I look forward to the potential future opportunity we have to attack his two white stones on the top. However this sequence results, I hope that we can still do that (unless we get something better). Dusk Eagle I don't think anything other than a is any good here. topazg Three 100%s for 'a' - do we post it? daniel the smith I think we have to extend. And I think a is the only move here. I think MW wants to take the D16 stone and get a large corner. topazg I'm not even sure how he thinks he can do that to be honest. He's too short of liberties for a ladder. topazg I'm at a loss as to what MW's aim is. Kirby I will vote 1 for 'a'. I guess 'b', 'c', and 'd' are other considerations with this kind of shape, but none of them really seem to make sense. Playing 'b' allows white to hurt our stone on top. Playing 'd' allows white to atari, and hurt our stone on top. 'c' is a little unusual, but even with that, white has the option of simply extending to the right and, again, hurting our stone on top. Dusk Eagle I voted for this move last time because I liked the cross-cut here, so I'm voting a.
topazg 'a' looks interesting, but I'm voting for 'b'. If White wants to make lots of weak groups, I think we should let him. At some stage, things are going to start dying, and we're a step ahead. It's hard for him to handle that latest stone anyway. A double approach should give us the top, jumping in the corner should give us the top. Running out will give us the left. Kirby I would probably play 'd' if I were playing the game myself. Incidentally, though, 'a' and 'b' were the other two moves that came to mind before I came to the SL page to write about this move. I think that 'a' feels right, but I'm not sure what to do after white responds with a hane from the right side. I like 'b' alright, but it feels a bit passive. The bad part about 'd' is that black can then attack our stone, of course. I suppose 'b' feels the safest of the options, even though I would very likely play 'd' in a game by myself. Regarding 'c', I am hesitant to play it followed by b, because then white can press down against the top left (at D15, for example). 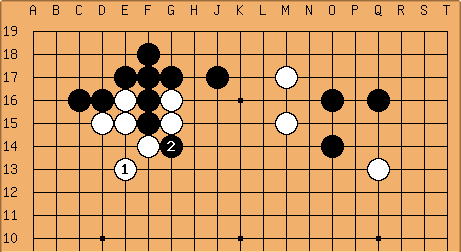 topazg The more I look at it, the more I think if Black plays 'a', White will play 'b', and leave the top right 3-3 for later to use the aji of that approach stone. Anything that lets him fix that group that we've got running would cause me to cry a little. Kirby It's a good way of wording it to call his two stones the "group that we've got running". Of course, 'd' is OK locally, but the difference between white attacking black and black attacking white seems pretty big. If we play 'd', we've defended the corner while putting a bit of pressure on white - but our stone is easily attacked. If we jump out at 'b', we are very safe on the top, and put pressure on the "group that we've got running", so I think that I like it better. As topazg mentioned before, a double approach is not hard to deal with, and the balance of power between groups seems more sensitive at the top right now. I'll put forward two votes for 'b' and one vote for 'd'. I like this voting scheme, by the way. daniel the smith Sounds like three of us somewhat favor b. If we play b and white jumps to f, what do we think about that? Next black g and white h? Good for us or no? Dusk Eagle If we play 'a' and white follows up with 'b', we can easily play c or i. We'll have a very strong corner group, and white will have nothing. I'm sticking by 'a'. 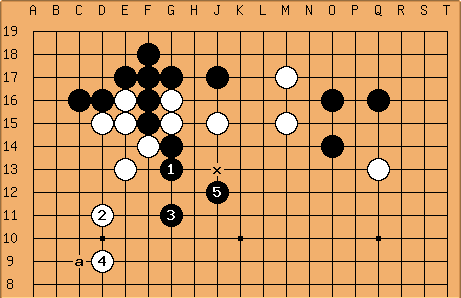 If we do end up playing b, and white plays f, I think g is pretty forced. Then white will play h, we'll probably d, and then white will cap our two stones in the middle. I'm not big on that, but it seems playable. topazg Yeah, I agree, I'm not big on that either. At least we have points on the left and the ability to swallow up a huge right side. I think if we play "a", I'm worried about our top right corner after we play "c" (not keen on "i", as there's still so much 3-3 aji). So votes - do we say 2 for first choice, 1 for second, and half for third or something? Kirby I'm not so sure that Magicwand will go for our 'b', 'f', 'g', 'h' sequence, because he is not usually one to throw away a stone, and the stone on the right seems pretty easy to capture after the action stops on top (i.e. he probably won't throw away Q13). So I don't think we have to worry too much about this. Kirby Well, it's also possible that I am an expert on being wrong about Magicwand. Perhaps the sequence isn't out of the realm of possibility, but I guess I just want to point out that we do get the benefit of hurting his Q13 stone if we ever get sente to do so. This leads to a different 'final result' from what we have above (i.e. we would select 'a' instead of 'b' at the moment), but using the other format, Joaz or Dusk have only 4/7 of the voting say that topazg has, and 2/3 of what Daniel and I have. It seems to make sense to me if we each have one vote, which we can split up in whichever manner that we'd like. This means that someone that is "sure" of a particular move will contribute more weight toward that move than if they are wishy-washy between two different moves. Just an idea, of course, and if we go with this idea, people might want to change their votes. What do you guys think? Dusk Eagle Well, if we don't go with a, I support b as the next best choice. I think Kirby's method of voting is probably best for future moves, but it's best not to change it on this move, as topazg and Daniel did not allocate their votes with that system in mind. So anyway, I am still a firm supporter of a, but since it seems unlikely that we'll play that way at this point, I'm fine with going ahead with b.
daniel the smith I like Kirby's voting method. I like b in theory, but I'm not in love with the likely resulting position (in the diagram below). a is growing on me. I'm having a hard time choosing between a, b, and d. I'll say 2/3 to b, and 1/6 each to a and d. If those that like a are super confident about it, I'm fine if that's the move we play. I like Kirby's also. I think that a reasoned concensus is best, but if we can't come to an agreement, and have to resort to brute democracy, Kirby's is simplest. Kirby I'm also starting to like 'a', a bit. The good thing here is, I think that either way we go, we are playing a pretty good move. topazg I cannot _wait_ to see people's responses to all of this conversation :D Ok, I like the method too, I'm going 3/6 on 'b', 2/6 on 'a' and 1/6 on 'd' now. People can go with 'b', update the voting scores and go with the highest, or whatever suits best really. AndyPierce I don't know how the Gang Malkovich works, but how about ...NO KIBITZING PLEASE... sorry Andy, but this is a private group game and we can't accept outside help. topazg - you are welcome to follow the game though, and even post your thoughts in "hide" tags, on L19. JoazBanbeck I'm still 100% in favor of 'a'. I think that the discussion may be getting too local. Let's think whole-board for a minute. 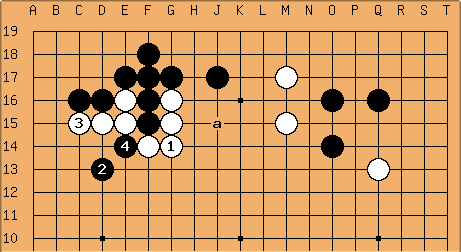 Note that in virtually all variations, black ends up with a wall facing south, with D4 sitting there as a perfect extension. Also, as a matter of style, recall how MW has won the majority of his games: he gets groups running toward the center, and eventually kills something. He rarely takes a corner and lets the opponent have the outside wall early in the game. Not only is 'a' good on a large scale, it will make MW play a style that is opposite of what he likes to play. Move 'b', on the other hand, is exactly the kind of game that he likes. topazg I disagree, I think it's precisely global considerations that we've just been looking it. In contrast, all the variations on 'a' have been very clearly local so far. You are still assuming White will even respond to 'a' locally, and I don't think he will. I also disagree with you on MW's style. As someone that has had 2 very close even games against him, the one thing MW likes is to develop thickness or some form of power base to work his attacking magic from. The reason I don't want MW to get 'b' is it gives him precisely that. Look at his last game against kirby. Connecting his stones and getting some form of influence gave him his entire game strategy. Look at his comments in the last game against me - he rued losing the ability to make the thick position at the bottom. I'm not saying 'a' is definitely worse than 'b' at all, but I personally feel that your reasoning has persuaded me slightly more towards 'b' than 'a'. Kirby Well, it seems there is some disagreement. Shall we vote, again, or is there more to discuss? If we do vote, I'll keep my numbers the same as stated previously. If there's more to discuss, I might change my mind. Dusk Eagle I'm going to keep my vote on a. Also, I might not be on the rest of the day, so I can't really discuss anything further. daniel the smith Looks like a wins to me. Making post now. JoazBanbeck The marked stones on the left are in the perfect position to crosscut. JoazBanbeck It goes badly for white if he tries to fight his way out. Dusk Eagle I originally supported a move around 'e', thinking that if Magicwand tried to swallow the pincer stone, we could always pincer his lone stone on the right. But now I support 'a', because the variation below looks cool. (Note: I typed this up before Joaz had posted the crosscut variation as well). Our stone makes this variation interesting. White might not play , but we can respond with and such if he does. This is terrible for white. topazg Is this ok? I think White's pretty thin for this, but it's a hairy fight. Can we play 12 at 'a' instead of jumping out again? Is that better to let White get to play on the right? I'm slightly in favour of it, because even if White plays "b" we can play "c" and make a bit of a mess of White's shape. Kirby I think it's OK, because if we get 12 in with the shown diagram, white's marked stone is hurt. JoazBanbeck This is exactly the type of game that MW wants. daniel the smith: I actually find this somewhat persuasive. Dusk Eagle So, I propose 'a'. 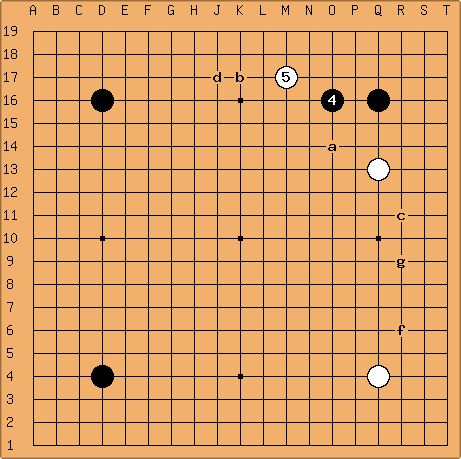 It moves out and keeps white's groups separated. I had also thought about 'b', but the shape seems a lot weaker - Magicwand could peep at our shape and it would have some serious holes. topazg Me too, and this is exactly why I wanted it before, albeit the wrong move order at the time. daniel the smith It's hard for me to imagine something other than a here. Kirby I think that a is the only move. On a related note, maybe we can consider what we have in store for us. I am almost certain that he will try to put pressure on our single stone with something like F16/17 or G16/17 (there is a small chance he might play M13 next to get more strength, but I doubt it). I wonder what we might do against this attack. topazg So, I don't believe magicwand will play again on the right next move, so I'd like to seriously consider what we do on that side. I'm suspicious that an approach at O3 (which I fundamentally like quite a lot) may help give him options of fixing his last approach stone cleverly (such as pulling back at Q6 and then playing R10 if we follow up our approach at the bottom). I'd be tempted to pincer immediately if he approaches one of our other corners. In my game against him, I found the best way of holding him off was to ignore his moves whenever possible and keep him finding "interesting" ways of protecting everything. 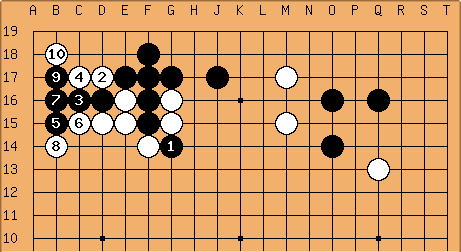 The game against araban illustrated to me just how effective he is against peaceful play. daniel the smith I think white will probably play around F3 next. If so, C6 feels too passive; I'd prefer a pincer around H4. I don't think there's any need to completely ignore an approach move to pincer around R10. That single white stone is too light to feel much pressure right now, IMO. topazg Yeah, that makes good sense. However, he's decided to go all exciting on us. My gut feeling is to play "a", aiming at "b" or "c". If he wants a fight, let's give it to him. However, it may be better to pincer first and let him chase us into attacking the other side. If we do this, I'd pincer the latest stone, as that's the one that will be able to look after itself when the dust settles (because the top left is our stone, and the bottom right is his). Dusk Eagle I suggest staying one back with a move at 'd'. I've heard from somewhere and it makes sense to me that, after white does a one-space jump and we do the same, having the stone a line further away makes is harder to attack. As for the whole pincer-vs.-not-pincer debate, I think pincering first keeps a better flow going. If we don't pincer first, Magicwand may well be able to extend along the top side and our one-space jump stone at 'a' won't be as good. Edit: So now I've looked it up using GoGoD (substituting a more common approach on the right), and both pincers seem playable, though 'd' is played slightly more often than 'b'. However, 'a' directly is rather seldomly played. daniel the smith I think d, white jumps, then a is standard and much more efficient than a directly. d would be my move. I think MW is just being a bully, this has to be too early for white. JoazBanbeck Running at 'a' seems premature to me. Isn't there some proverb about the smaller the gap, the more effective is your play when you split it? True, we do not want to get locked in the corner, but he cannot lock us in with one move. I'm generally in favor of pincering something. After some thought, I favor the approach at 'f'. It is effectively a very long pincer, and it is difficult for him to make an effective play on the side against us. See my L19 post for details. Kirby I like "d". The stones in the top right are pretty strong, and "d" takes away his approaching stone's base. Joaz' suggestion - how to follow? White has a fairly hard to attack group on the right, and Black's corner is suddenly in more danger. I want to play somewhere around White 7 as Black, but I think the preparatory pincer on top should allow us to push White around. In this board position, I think White will do the pushing - how had you intended Black to continue from here? One other thought: our two stones on the top are now for fighting (before white's last move they could fight or make a big house). We need weak white groups around them so they can be effective. This is why I think white's move is bad; he needed to stabilize his other stone first. Now we (should) get one strong group between two weak white groups. Dusk Eagle I don't think it's good to let our top two stones come under attack unless we are simultaneously attacking a white group. That's what the pincer at 'd' is to help do. If we play the approach, I'm concerned white will be able to solidify his groups before turning to attack our top one. topazg Magicwand likes making complicated situations with fighting and aji. I see no reason to allow a double approach, so I'd keep things simple with O16. daniel the smith I always O16 in this position in handicap games, and I've had a 7d tell me it was correct. I don't like to play high twice on the same board, though, because white eventually gets sente and undercuts one of them. On that note, if he leaves it alone, we can also pincer it quite effectively too. It's up to us to rip sente out of his dead hands I think. Kirby We could consider a counter-approach at O3; I suspect MW will approach the bottom left next. Despite that, I also like O16 better at the moment, because it seems bigger. Dusk Eagle I also agree with O16. I don't have any deep and insightful thoughts behind it, it just seems like the most obvious move (not to say there aren't others).